Some Zimbabwean teachers stayed at home while others went slow on the job as a strike at state schools got off to a patchy start amid fears of further intimidation by security forces who cracked down hard on last month’s protests. Zimbabwe is grappling with an economic crisis marked by cash shortages and rising prices of basic goods after President Emmerson Mnangagwa hiked fuel costs 150 percent last month. dated by police and CIOs (Central Intelligence Organisation)," the Zimbabwe Teachers Association (ZIMTA), the biggest teachers' union, said in a circular to members. 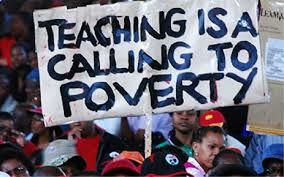 Zimbabwe has more than 100,000 public sector teachers. The Bulawayo-based online news site, Centre for Innovation and Technology, said teachers at several schools in the country's second biggest city did not turn up for work and parents had to collect their children. Government workers are demanding wage rises and payments in U.S. dollars to cope with soaring inflation and an economic crisis that has sapped supplies of fuel and medicines. Many Zimbabweans, who have seen purchasing power eroded despite adopting the dollar in 2009, say Mnangagwa has not delivered on pre-election pledges to kick-start growth after the exit of Robert Mugabe in 2017.